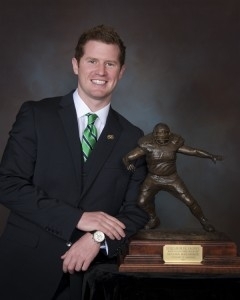 SPRINGDALE, Ark., Dec. 3, 2012 - Monday, senior quarterback, Matt McGloin from Penn State was named third winner of the Burlsworth Trophy in Springdale, AK, at a ceremony hosted by the Springdale (Ark.) Rotary Club. The award is given to the nation’s most outstanding player who began his career as a walk-on. On hand to present the trophy to McGloin was Marty Burlsworth, founder and CEO, of The Brandon Burlsworth Foundation. The Burlsworth Trophy Presentation ceremony was held at the Northwest Arkansas Convention Center. McGloin ends his career with the Nittany Lions ranked No. 1 in school history for career passing touchdowns (46), completions in a season (270), attempts in a season (446), passing yardage in a season (3,266) and passing touchdowns in a season (24). He helped Penn State finish the season 8-4, throwing for at least 200 yards and one touchdown in all 12 games. Penn State won eight of its final 10 games. McGloin, who redshirted as a freshman in 2008 and shared playing time in 2010 and 2011, threw for a career-high 398 yards and four touchdowns in a victory against Indiana. Currently McGloin, a May 2012 PSU graduate, ranks third in the Big Ten in total offense and fourth in pass efficiency. McGloin, 6-foot-1, 210 pounds, threw for 5,485 yards and 58 touchdowns in his career at West Scranton (Pa.) High School. Still, his only scholarship offer came from nearby Lehigh University. McGloin was among two strong competitors Jordan Kovacs, SR, safety, University of Michigan and David Quessenberry, SR, tackle, San Jose State University. Kovacs is a four-year starter at safety for the Wolverines. He was named 2nd Team Freshman All-American and Sporting News Freshman All-Big Ten. As a sophomore, he ranked 2nd in the Big Ten with 116 tackles. As a junior, he was named to the pre-season Lott IMPACT Trophy watch list and finished the season as the team’s 2nd leading tackler with 75 stops. In 2012, he has started every game, registered his 300th career tackle, and is considered one of the top safeties in the nation. Quessenberry has 35 career starts on the offensive line and had a streak of 27 consecutive starts at one point. As a junior, he was named a 2nd Team All-WAC selection and was named the Team’s Most Valuable Lineman. Prior to the 2012 campaign, he was voted Team Captain, named to the Rotary Lombardi Award watch list, and picked as a 1st Team pre-season All-WAC selection by Phil Steele Magazine.